Looking for private in-home or in-studio Fiddle lessons? Our Belmont teachers are ready to get you started. Find your teacher today! Fiddle is another name for the bowed string musical instrument more often called a violin, and is the term for the instrument used by players in all genres, including classical music. Fiddle playing, or fiddling, refers to various styles of music. Fiddle is also a common term among musicians who play folk music on the violin. Lessons would start with the basics: Tuning, hand/bow technique, placement, ear training, notes, reading, songs, scales, theory and learning how to take a solo. I enjoy helping all levels and ages to learn awesome tunes while using great technique! ers, and a basic fix-it kit for common instrument issues. I also try to keep backup books and a shoulder rest around at my studios so if someone forgets their equipment we can still make good use of the lesson. I work with students exclusively by ear, concentrating on development of rhythm and the syncopation of melody against rhythm. Incredibly patient and encouraging. Explains things in ways that make sense. I am greatly encouraged ! I am a Retired Federal Special Agent and I was born in Glasgow, Scotland. I've always wanted to learn how to play the Highland Bagpipes. I met William a few years ago and he has made my dream come true. William is a caring and patient instructor. He will teach you all details and techniques of playing the instrument and how to play the tunes correctly. William will take a complicated piece of music and will show you an easy path to successful completion of of playing the tune. I have seen William teach all ages and genders and special needs students and all have been successful musicians. William has transformed this hard headed student from a person that could not read music to a performing as a band member with the Tucson Highlanders Pipe band. I STRONGLY recommend William as a Bagpipe Instructor. Simple, easy and fun way learning the fiddle! 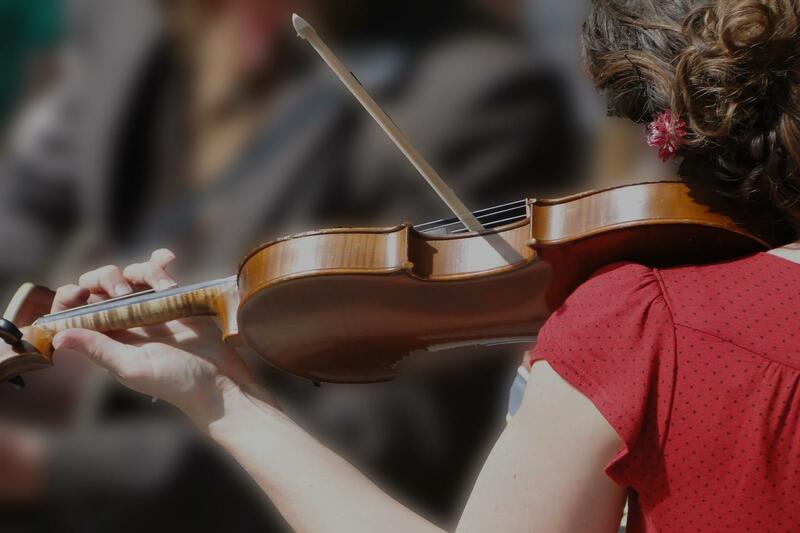 I can teach you fundamentals and special country style, folkish fiddle sound through your favorite songs. Let's get started! Hi, there! My name is Krisztina and I can't wait to meet you! I've been teaching private lessons since 2010. I love helping my students to learn how to play the violin, to be able to play their favorite tunes or helping them preparing for auditions for schools and ensembles. I went to the Liszt Academy of Music in Budapest, Hungary and earned my Masters Degree in Music in 2010. I'm a friendly and patient teacher and my teaching style engages student in the learning process also fun, and creative. I look forward helping you to reach your goals! Ms.Krisztina is a joy to work with. My girls started with her at 5 & 6 and she worked so well with them. She has kept their interest since and has introduced new concepts in a way that isn’t overwhelming, but enjoyable and fun. She has a lot of patience with them and has a skill for drawing their attention to the violin & music. Violin or viola, Krisztina was a very caring and nicest teacher I have ever had. Unlike myself she was always on time. Her friendliness made every lesson more fun while she really cared about her students and always been honest with her comments. I would highly recommend Krisztina. She truly likes teaching violin. She goes beyond the call of duty. For example, she sends emails with her or other musician videos for practice at home, works over the allotted time if needed and if she is able to, sends texts and responds promptly. My daughter was beginning to say she was getting less interested in violin and before I could say anything, Krisztina made my daughter excited about it again with new things to learn. There is nothing negative to say. She is an excellent teacher. If you love and want to learn Scottish and Irish fiddle tunes I have lots of fun great music to teach you. If you love country or pop contemporary music I can help you learn that and teach you how to improvise violin or viola solos. I teach music from very beginners to very advanced. All ages.